Home to some 40,000 elephants, all the big cats and more than 400 species of birds, Zimbabwe’s Hwange National Park is one of Africa’s top safari experiences. Here are 15 things you didn’t know about it. 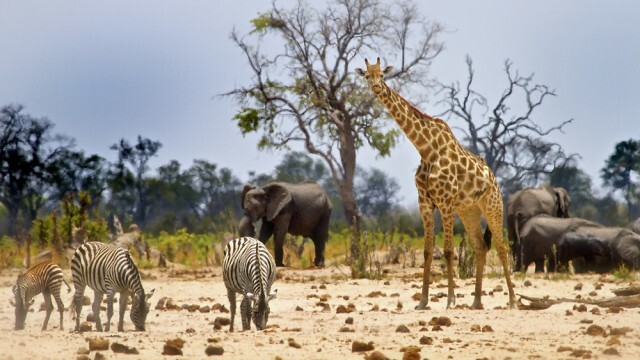 When it comes to size, Hwange is not only Zimbabwe’s largest national park, but at 14,651-square kilometers (5,656-square miles), it’s also one of the 10 largest parks in Africa. Hwange National Park is home to the “Presidential Herd” of elephants. At an estimated 40,000 strong, it’s one of the largest herds on the continent. It isn’t unusual to see close to 100 pachyderms at once. You can stay inside the park or outside, but the most luxurious accommodation is located in the private concessions surrounding Hwange. Here you’ll find my favorite property, Ivory Lodge, located next to a water hole that’s popular with the park’s elephant population. No fences restrict the animals from roaming between the park and the safari lodges just outside it. Regardless of what lodge you stay at, it will likely have a “hide,” and you should definitely check it out. Hides are protected viewing areas, usually located near watering holes, which allow visitors a chance to safely observe animals up close. Hides are especially cool for night viewing. Tip: Keeping quiet inside the hide is of paramount importance. Besides the massive elephant population, Hwange is home to some 106 other species of animals, including all the big cats. For bird lovers, there are more than 400 species to watch from here. To maximize the chances of spotting animals, especially the big cats, hit up Hwange during the dry season (July-October). During this time, animals are thirsty and will travel long distances to drink from the park’s 60-odd watering holes. Many of the holes are kept filled by park officials. Painted dogs are some of the most special animals to spot in Hwange, especially if you manage to see a pack hunting. These African wild dogs are endangered, and less than 5,000 remain on the continent. Zimbabwe is one of their last strongholds. If you aren’t lucky enough to spot a painted dog on safari, pay a visit to Zimbabwe’s Painted Dog Conservation. It runs a rehab facility for sick and injured pups with the hope that once healed, these dogs can be returned to their pack in the wild. If you want to prove your prowess as a safari guide, head out in your own vehicle on a do-it-yourself, self-drive safari through the park. You have to stick to the roads, but so does everyone else — no off-roading is allowed by individuals or safari companies in Hwange. If you choose to drive yourself, but aren’t having much luck spotting animals, head to Nyamandhlovu Pan, where you can climb a high-rise viewing platform to look out over a popular watering hole. You can stay inside or outside the park. One benefit of staying outside is that the lodges are on private estates, and animals roam freely between them. So even if you aren’t inside the park itself, you can still go on game drives and see animals, but you won’t have to pay the $20 park entrance fee. Unfortunately, Hwange is located within a malarial zone, so you’ll need your anti-malarials before a visit. It’s really not a big deal, just like popping an ibuprofen. Hwange has an amazing array of birdlife, but there is one even the most inexperienced birdwatcher can’t miss. The Kori Bustard is the largest flying bird in the park, and will only take to the air if absolutely essential, preferring the ground. During the dry season, it’s hot during the day, but you’ll need your winter woolies at nighttime, as the temperature can drop below freezing. Animal viewing is better during the dry season as they congregate around the man-made watering holes. No man-made knitted woollies for the elephants though! You may be lucky enough to see a strange little creature, who hops about looking all the world like a small kangaroo. This is the Springhare. Some of the lodges are on private concessions and have the opportunity for a night drive. So keep your eyes open! A visit to Hwange National Park is to see a glimpse into the past — this is what much of the interior of Africa might have been like more than 150 years ago.